Just because the internet and its myriad machinations mostly work, it doesn’t mean it always does. Websites aren’t always available, email isn’t always received, passwords aren’t always safe, things aren’t always what they seem to be on the internet and the cloud… well, the cloud isn’t really a cloud. 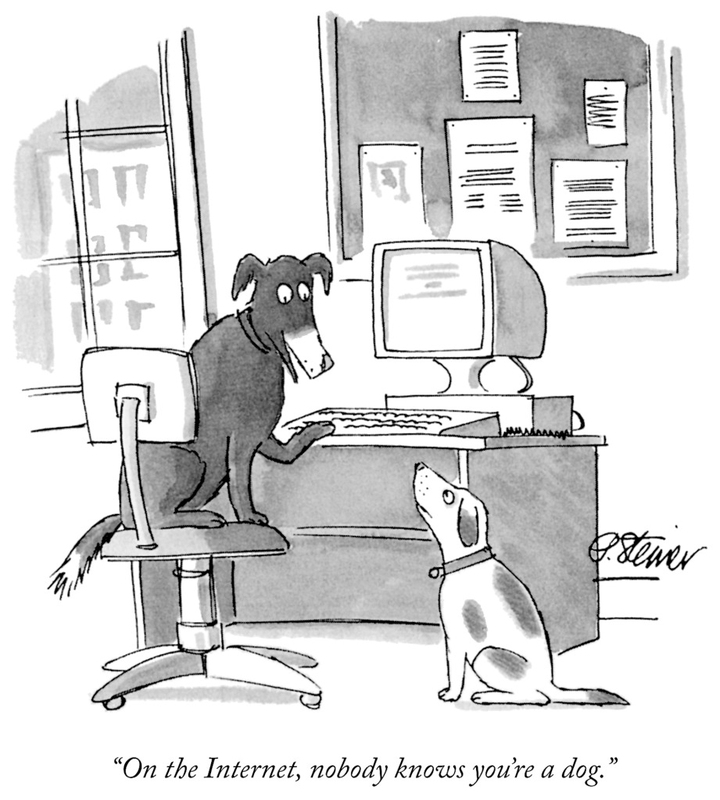 In its famous cartoon about what the internet really is, a sentiment that is as true today as it’s ever been, The New Yorker depicts a world that is manipulated, distorted and not actually real. In one resounding image Peter Steiner captures a network in which it’s possible to easily pretend to be what you are not. Note that this cartoon was published as the internet was showing early signs of becoming mainstream on 5 July 1993, when one Mark Elliot Zuckerberg was only about nine years old. And yet we are completely dependent on the internet today. This all encompassing dependence will only grow as time goes by. The internet of things (yes, it really is a thing), will just add to our collective dependence on the machines. As will driving and flying, health, finance, work and many other aspects of our future lives. In its final episode of its fourth season, the brilliant Silicon Valley, made by Office Space creator Mike Judge, illustrates how, vaguely ridiculously, a vast collection of fridges can all be stringed together in a huge distributed data storage network as easy to access as a local computer drive. It may not be as ridiculous as it sounds. Many believe the internet is in reality heading towards this kind of distributed network. So, while humanity’s collective existence is increasingly dependent on a digital network of networks, its very stability is under constant threat. The recent ransomware attacks WannaCry and Petya highlight just how unstable and precarious the network can be. We trust, use, depend on and in general live by the digital connections we form, but it’s far from perfect. Fake identities and social manipulation are rife in politics. A comprehensive recent University of Oxford study about these kinds of shenanigans in the political scene in Poland is a case in point. The Computational Propaganda in Poland: False Amplifiers and the Digital Public Sphere report elucidates the minefield that represents modern digital intellectual highway robbery, especially via social means. This snippet from the summary of the report makes for chilling reading: “The quantitative portion of the report features an analysis of Polish Twitter data, and demonstrates that a very small number of suspected bot accounts are responsible for a disproportionally large proportion of activity on the sampled political hashtags”. Perhaps a strong dose of cynicism is required. Instead of thinking an email has been received simply because it has been sent, instead of easily believing a story because it’s published on Twitter and instead of relying completely on a single online system, we should rather use it all with circumspection and trepidation. Make sure you always have many backups (real and in the cloud), multiple avenues for people to be able to connect with you if need be, alternatives to a single device or server or whatever. Do not rely on one email channel, one alert, one password. A brilliant software engineer, who hails from the heady days of coding tape readers, once advised me to store really valuable stuff on proper physical hard storage systems. Still to this day, one of the best digital storage devices is the analogue tape drive. Just like vinyl. Technology can perhaps help navigate the bony digital rivers. A credible system monitor can assist everyone with auto-cynicism baked in. A little like a gigantic version of Google’s “Are you sure you want to send this email” type constant warning. A tool that helps us all to rather not trust than trust as a departure point. This can work well… until it’s hacked. Then we’re all up the digital river again… without an internet of things-enabled paddle. Sigh. Sometimes you just can’t win.